Mickey springs Janae and Ned getting frisky on the couch. Rachel spies Pepper hugging Ringo whilst coaching him in The General Store. Rachel turns up to see Pepper, and asks her what's going on. Valda is on the phone to her website person's answer machine, desperately trying to get hold of him. Lou heard the call, and Valda tells him it's a supply problem, but Lou knows there's a problem. Valda continues to deny it. VALDA: You saw the launch; they can't get enough of my smalls. Rachel demands to know if Pep and Ringo are having an affair which Pepper, of course, denies. Instead, Pepper says she's tutoring him because he failed his last exam. Rachel doesn't believe her and walks out. Steve confides in Harry that Didge might be pushing herself too hard in rehab. Harold says that she's clearly a very determined young lady. Mickey interrupts – he'd like to know why his dad and Janae were acting weird when they got home earlier. Lou tells him they were looking for a pen, or Steve suggests they were in training for the couch wrestling championships. Valda rolls her eyes. Steve tells Mickey to ask Ned, but Lou stops the boy running off by asking him to try a new muffin he's just gotten in. 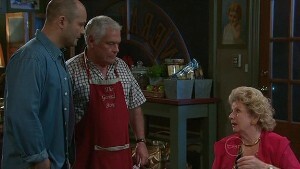 Valda reprimands Steve for not telling Mickey the truth, so Steve concedes that he and Lou will ask Ned to have the ‘birds and the bees' conversation with Mickey. Valda thinks they're both cowards for not doing it themselves. She offers to do it himself – so Steve finally agrees…he'll tell Mickey what his dad and Janae were really up to. JANAE: What?! And be part of ‘Janae and Ned : The Sequel'? I don't think so. Thank goodness for that. Ned tells Janae that Mickey's too young to know, and the rest of the family didn't mind what they were doing. Ned starts tickling Janae again but they stop abruptly as they hear Mickey coming home yet again. Mickey runs off to play with the guinea pigs, and Steve tells Ned they need to have the The Talk. JANAE: Okay, it was embarrassing. But we don't need to talk about it. STEVE: No! No! Not you guys! I'm talking about Mickey! Steve says he has to tell Mickey about the Facts Of Life, but Ned's not keen. Steve also confesses that Miranda had the conversation with Riley, so he hasn't really ever had to do it himself. Janae thinks that Steve's no help, whatsoever. Zeke tells his parents he's off, and they're paying no attention. KARL: Sorry, mate. Have a good run. ZEKE: (waving his goggles) Swim. I'm going SWIMMING. Susan dismisses him with a wave, and continues to read up on Rachel's reading programme, impressed with the content. Rachel comes into the lounge in her dressing gown, and declares to Karl and Susan's horror that she's not going. She says she doesn't feel comfortable going right now – not because of Susan's trial, but because she's not into books right now. She doesn't feel it, and there's no point wasting everyone's time! Susan can't believe it. Karl thinks this wasn't a cheap programme, either, what with the airfare and accommodation…! Susan tells her husband that she'll get to the bottom of it. Carm arrives at Marco's, and he's very pleased to see her. She apologises to him for running out on him the day before, and he apologises for questioning her personal affairs. She wonders if his interest is purely business – they've both been flirting, but she tells him that it has to stop. Marco understands. Carmella tells her that her sole focus has to be on setting up a future for her and the baby. Marco thanks her for her honesty – it's not every day his heart gets broken before breakfast. The kids are doing some trust exercises, and Pepper is taking the class. She asks them to get a partner, and Rachel really doesn't want to partner up with Ringo. She tells him that trust isn't his strong point, and he wants to know what's wrong with her. Pepper asks what the problem is between them, so Rachel tells her the class is lame, she's not learning anything. Plus, Pep's not qualified to talk about trust. Pepper demands that her student apologise, but she doesn't. Marco and Carmella are trying out recipes made from their supplies. They try the lychees and strawberry sauce, and their spoons get entangled in a supposed romantic way. Marco says he has to be honest with Carmella, and confesses that he's crazy about her, and wants to kiss her. But he won't because he knows she doesn't want him to. He says he'll be just her business partner and nothing else. Ned and Janae have sat Mickey down for The Talk. Ned tries to begin to explain about men and women loving each other, and spending time…but he doesn't get anywhere. So Janae tries an analogy. Men and women are like vegemite and cheese – the sandwich that Mickey's eating. JANAE: Just work with me. Cheese and vegemite are fine on their own, but when you mix them together, you get something very special. And sometimes when cheese and vegemite love each other, they need to spend time together, so that one day they can have a sandwich of their own. Janae is shocked! “Really? !” She thinks that's lovely. NED: So, erm, do you understand all of that? Mickey goes off to play with the pups. Susan finds Rachel alone by the lockers; she heard about her altercation with Pepper in the health class. Susan demands to know what's going on, despite Rach's evasiveness. Rachel confides that she thinks Ringo and Pepper might be having an affair. SUSAN: Why on earth would you think that? RACH: Because I saw them together. RACH: Studying, apparently. But I know that something is going on. She says she hasn't spoken to Ringo, and what happened with Carmella is happening all over again. Susan tries to reassure her that Pepper would never do that. Cut to the classroom where Susan comes in to see Pep. Susan says she's had a chat with Rachel, and Pepper says she tried to talk to her, too. Pepper admits she's been tutoring Ringo, and confirms that he's definitely not getting the wrong idea from her. Susan tells Pepper that Rachel is so anxious about Ringo that she's been to-ing and fro-ing about the Canberra trip. Pepper thinks a break might do her good. She reminds Susie that she's going to see her dad next week, and she doesn't know when she'll be back. Susan says she'll talk to Rachel, make sure she knows that what she saw of Pepper and Ringo was just a misunderstanding. Pepper comes home to see Ringo with her teacher face on. She tells Ringo that Rachel thinks they're dating – their spending time together combined with his lying is forcing her to believe it. Pep says she's said nothing about his eating disorder, but he has to tell her something. Rachel thinks she must just be stupid and insecure. KARL: You're in the beginnings of a resumed relationship. You have to let the trust develop again. Susan throws Karl a surprised and ‘excuse me?' look. KARL: Well…we've both seen our fair share of teen romance. Karl tells Rachel that love is never easy, and if she went to the literary camp, she'd know that! Rach wonders if she has years of this torture ahead of her. Karl says she also has the joy and the good stuff! Ringo comes to the door to see Rach, and Susan quickly remembers the walk that she and Karl have to go on with Audrey… Ringo explains to Rachel about the exams, but Rachel thinks he should have confided in her. She senses that there's something else going on – and if he loved her, he'd be able to tell her. He says nothing. Mickey's playing with a friend at the guinea pig cage, and they're wondering how many sandwiches it takes to have more babies. Steve, Ned and Janae are in the kitchen, and Mickey comes out for more sandwiches before going back to the guinea pigs. Ned and Janae tell Steve how successful their chat was – they explained the Facts Of Life in a way he'd understand. Ned thinks Janae's a natural. The adults crowd round the door to listen to Mickey chatting. He tells his friend that the way to have more babies is to mix the cheese and vegemite in just the right way to make something special. His friend suggests that they have babies, so Mickey hands him a sandwich and tells him he'll have to love it very very much. Steve grins at his brother, who rolls his eyes in despair. 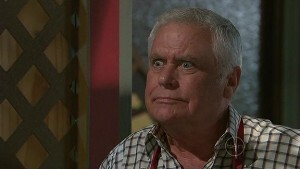 The Kennedys are in the kitchen with Zeke, and Rachel appears with all her bags. Hundreds of them. She's decided that she likes to read about tragic heroines, but not be one. Susan and Karl are pleased, and Rachel thinks she should forget boys and get back into books. Zeke welcomes his dorky sister back by lifting her up in a bear hug. She, in turn, licks her finger and wipes it down his face, much to his disgust. Pepper lectures Ringo on not telling Rachel he loves her. Ringo tries to wallow in self pity by saying she won't love him if he tells her the truth, but Pepper says he's left Rachel no option but to walk. She encourages him to go back to tell her he loves her, but Ringo is determined to wallow in his own little quagmire of self pity, and believing that it's all his fault and everyone hates him. Oh, get over yourself, man. The Kennedys are getting into the car to take Rachel to the airport. Ringo chases after their car, and it stops halfway down the street. Ringo waits, but Rachel tells Karl to keep driving; she doesn't want to miss her flight. Ringo watches her leave, in despair. Well, your own fault, Ringo – I think that's what they call a self-fulfilling prophecy. Carmella and Marco are bored with their spreadsheets and numbers, and so start to pack up. Carmella bends over in pain – the baby kicked hard, apparently. He says he'll get them an afternoon snack if the baby's hungry. Whilst he's gone, she bends over in pain again. Cut to seconds later, Carmella has gone to the bathroom, and isn't responding to Marco's questions about food. He finds her, when he hears her calling out in pain over the bathroom sink. She tells him to call an ambulance – something's not right.